Road to Fitbloggin’ Series - Reboot the Diet: Where Does All the Time Go? One of the benefits of working at a fitness company is we are encouraged to take time during our days to simply move. At the JumpSport Trampoline's corporate office, there is a mini-workout area in the warehouse and a warehouse walking course marked off so people can get in a mile during their break if they so choose. Those of us who work from home (like myself), generally have a JumpSport Fitness Trampoline in their offices or home to do full workouts or even little breaks during the day (I have a 550F as well as an iBounce Trampoline). We also have access to some of the awesome trainers. Like Jeff McMullen, who kindly took some time out of his schedule last week to talk to me about Fitbloggin13 as well as weight loss in general. Before there was a Mac or even a Milt, I would go the gym 3-4 times a week, whenever I wanted for as long (or short) as I wanted. My only real responsibility was work and Howie. After I met Milt, it was just as fluid and casual, albeit with a lot less gym time. In full disclosure, I gained 20 lb when I met him (thanks Babe!!). Then- Do dishes, fold laundry, finish up any wayward work emails from the day, maybe watch a TV show or two I like…MAYBE just MAYBE spend some time with my boyfriend alone … and definitely spend some quiet time with Howie. Admittedly, there are variations on this theme….Milt works retail, so his schedule changes weekly. But that’s the basic outline folks! So how do I fit a workout a week much less a day into a schedule built around a 16 month old? Jeff (@jefffitnesspro) had some great tips for me and everyone else when we worked out at the bridge last week. To make sure I do his basic workout 2-3 times a week, I have set an alarm on my Outlook to go off on Mondays, Wednesday and Thursdays at 10am. Outlook cannot make me do my workouts, but it can at least remind me! In addition, I have been using my FitBit and MapMyWalk iPhone App for some inspiration. I am trying to hit 10k steps a day, and I have started two different walking regimens…ok, they are more like walking “dates,” but they work for me and for my family. Two days a week, Wednesday and Friday, I have been walking Mac to daycare, a little over 3 miles round trip . Secondly, on nights when Milt is home, we have started to take a family walk after dinner but before bath time. It’s about a mile, and I wear flip flops, but it is movement. 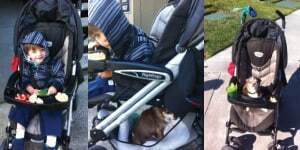 On Wednesday and Friday, Mac gets up 15 mins earlier, I trick out his stroller with good breakfast munchies, put Howie in the lower basket and roll on down the road. Takes about an hour or so round trip and many days my friend Christa joins me with her 1 year old son too. If not, I have taken to listening to books when walking. Since, I don’t have time to read anymore, I now cherish Audible App. I am currently listening to John Lescroart's new thriller The Ophelia Cut. He is a San Francisco writer I have been reading since high school. I am delighted that I have found a way to fit his (and others) storytelling back into my life, even if I cannot actually read the book. Only problem with that? I walk the stroller back sans child but with Howie riding front and center. The looks I get at stop lights are classic. I often wonder as yet another person stares pointing as I cross in front of them, how many people go to work and mention the crazy lady walking her Chihuahua in a stroller? Luckily for me, I never have much concern for other people’s opinions of me. Now here we are at a holiday weekend. Here’s to hoping I set a good example for myself and my son when our new schedule is disrupted!